‘Every movement counts’ is the motto of a new Department of Health campaign to encourage children aged under five to be physically active for at least three hours a day. Alarming statistics show only one in 10 children aged two to four is active for the minimum recommended amount of time. 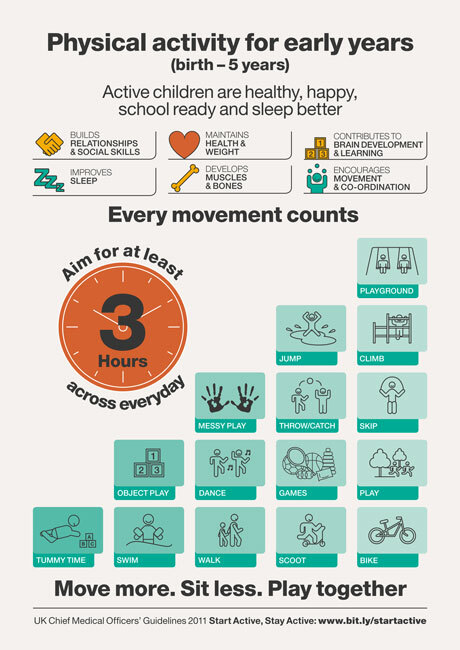 The UK’s chief medical officers (CMOs) first published recommendations for physical activity in 2011, but still very few children are active enough, a fact that has inspired the publicity drive and information graphic (below) aimed at parents and early years professionals. The list of suggested activities would appear to cover most things besides sitting watching television, with crawling, walking, ‘tummy time’ and messy play featuring. The premise is that ‘active children are healthy, happy, school ready and sleep better’.